Yet another excellent free shmup from the inimitable developer is a new take on the classic arcade game Galaga. Cho has seriously sped up the pace and intensity, but was considerate enough to leave the player a gift: the dreaded tractor beam is now in your hands. Similar to Galaga, the action takes place entirely on one screen, with endless waves of enemies descending towards your ship. Press Z to attack, and press X to appropriate to up to ten enemy ships with your tractor beam for added defense and firepower. After using the tractor beam you'll need to refill the power meter by destroying enemies before you can use it again. The speed at which the meter fills is dependent on how many ships you currently control, which means that the meter will fill quickly when you need it the most. Avoid incoming bullets and strike down all enemies. At the title screen, you can select a game mode (CLASSIC, BASIC, MODERN). CLASSIC mode: Sporadic firing; Use a capture beam to make a friend of an enemy; When your ship collides against an enemy, your ship is destroyed. BASIC mode: Middle course; You can use the capture beam anytime; When your ship collides against an enemy, your ship is knocked away. 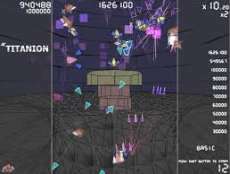 MODERN mode: Bullet hell; Use a provocation beam to force an enemy to fire more bullets and earn a bullet multiplier bonus; When your ship collides against an enemy, nothing happens. Your ship and an enemy go through each other. A score multiplier is displayed in the upper right. It increases when you destroy a enemy and decreases slowly when the enemy is on the screen.